Each year, 6 new Society Advisors (1 from each Region) are selected or elected for a 3-year term on the Advisory Council. The next term will start on January 1 and continue for three years concluding on December 31. Regions contain between 10 and 31 Societies representing between 13 and 19% of the Graduate population during any given year. 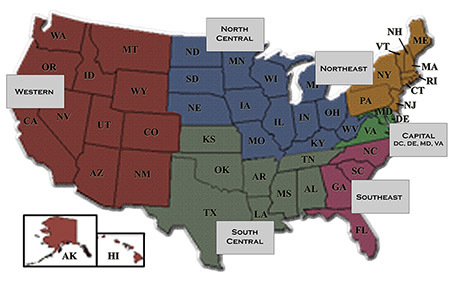 Each Society Region (Northeast, Capital, Southeast, North Central, South Central, and Western) is asked to select a new Society Advisor to serve in this role. International Societies are assigned to these Regions. Questions can be directed to Society-Support@wpaog.org. WPAOG Governance information is available online at https://www.westpointaog.org/governance. Some areas may require a Graduate to sign in to access. Committee Member - help conduct our Association’s business in areas such as ethics, finance, award programs, membership review, investments, fundraising, Class and Society support, integrating technology and strategy, and so forth. Committees meet face-to-face, in conference calls, and via other electronic means, depending upon the nature of their tasks. The WPAOG Chairman will ask every Advisor to serve on a committee. Communicator and Representative - develop opportunities to enhance your constituents’ understanding of today’s U.S. Military Academy and WPAOG. Be an advocate for WPAOG’s programs and services. Provide feedback on possible initiatives or solutions and perspectives of your classmates, former teammates, or other West Point associates to committee actions and other processes. Help Society Support with collecting required documentation from Societies, run elections for new Regional Advisors, help to revitalize inactive Societies, vote on new Society applications, and help with running sessions at the Leaders Conference. Philanthropic Leader - financially support West Point from 2018 to 2020, making an annual gift to a fund or funds of your choice at a level consistent with your capabilities. Attendee – do your best to attend the two annual Advisory Council meetings at West Point. Typically, they are scheduled for May and November. Timeline: Many Regions begin the selection process prior to the Leaders Conference so the election can be discussed or concluded at the conference. Some Regions start as early as March and others collect the nominations at the Leaders Conference. The Advisor’s name needs to be provided to WPAOG no later than October 1. The sooner the better, in order for us to educate your new Advisor on WPAOG programs, today’s West Point, and ongoing issues. In November, we will be assigning Advisors to committees. Who runs the election: Current Regional Advisors conduct the election process. One may take the lead or they may do the election jointly. Criteria: Some Regions have packet application processes that include the collection of: resumes, reference letters, nomination forms, letters of interest, Society endorsement letters, etc. Other Regions, simply collect names. Only graduates in good standing can serve as Advisors to WPAOG. Candidates must be willing to fulfill the WPAOG expectations associated with being an Advisor. Some Regions rotate which Society will provide an Advisor that year so all have the opportunity to serve. Other Regions take into consideration having a representative from a small, medium, and large Society. Who votes: All Regions currently allow each Society a single vote. Some do not look for a quorum and tally votes based on who showed up at the conference or who participated. This does not mean that Regions cannot utilize a weighted system, just that it is not currently being done. How votes are collected: Some Regions do elections face-to-face, some collect via email, and some use WPAOG’s voting sites. Nominees: Nominees vary by Regional interest. Typically, there will be between 1 and 8 nominees in a Region.